TRANS PHONE TEST: Mentalist asks anyone in the audience to use his cell phone to call home and ask anyone to choose a number (which is kept secret). Another person chooses a number secretly. These numbers combined secretly by the spectators to arrive at a page in a book. Mentalist reveals the passage in the book plus the two numbers thought of. You never approach the spectators. WEIRD PROPHESY: You write 6 digits on a card and give to anyone to hold. The digits are visible to the person holding them. Members of the audienc call out 4 digits while another person on the phone chooses 2 more. The six digits choosen are the ones on the card! Baffling beyond words to say the least. DAY OF JACKAL: A perfect stranger is called and asked to name three items. These three items have been written down before the show and held by the audience. WIZARD WALK: According to Mann this item alone is worth the price of the book. Call anyone over the phone tell him to get the telephone directory and to choose a page and name secretly. You tell him the name and phone number of the one chosen. Remember this is done over the phone! WAY OF THE WARLOCK: A person chooses a word from a book over the phone. You reveal it. RANDOM HOUSE MYSTERY: Listener has free choice of a word. Mentalist tells him the page and column it will be found in his dictionary. Fantastic effect. 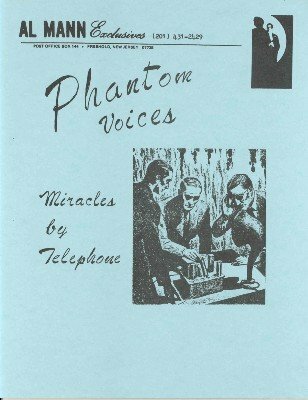 SPIRIT'S CALLING: Speak with the dead via telephone. Your audience will be convinced you did!